In your room, living room, or kitchen, you hear one of those songs where you have to dance to and you dance like nobody’s watching for reality is nobody’s watching but given you were in a public space you feel inhibited for people you know or may not know are watching you. To save the embarrassment you just bob your head to the beat or if you are really risky you do a two step, but really you just want to let loose and do that choreographed routine you created in your underwear holding a hair brush in hand in front of the mirror. Why hold back? Life’s too short to care about what other’s think of you for as long as it makes you happy. I am free spirited so I can dance anywhere for I don’t really care what people think of me. When you see someone dancing randomly on the street, does it not put a smile on your face? I put myself in other’s shoes and dancing in public isn’t embarrassing unless you are dancing provocatively or ridiculously. Most likely you won’t be dancing like that but when you are looking like you are having fun you create an energy people respond to positively. Think of all the mall flash mobs, TV dance shows, break dancers on the street, that are in the public eye and you look at them like they are awesome! So why can’t you be awesome too? How to Dance Like Nobody’s Watching? The easy solution is to drink for drinking can easily loosen you up but this solution isn’t always ideal for some people. I know this definitely makes me feel more uninhibited but drink responsibly! I think dancing like nobody’s watching has to do with confidence, security, and being free, so this is a list of tips to boost your confidence to dance. The key thing is to have fun and live free! 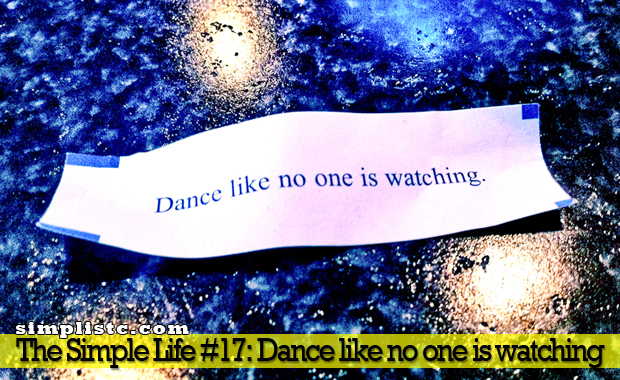 We only live once, so why not dance like no one is watching for it is the only way to dance. When I dance, I remember my oneness with everyone else in the room and with the universe. It is like the dam broke, and everything came out to be healed. I feel totally revealed and safe in the nurturing space I created. I can go so deep yet in such an easy, liberating way.